Found this plant at Specks. This member of the Cucurbitaceae family was described by Ernest Friedrich Gilg and Hermann August Theodor Harms in 1923. It is found in rain forests of eastern tropical Africa from Uganda south to Tanzania Malawi and Congo, growing in a well drained soil with some water to lots of and some of sun. 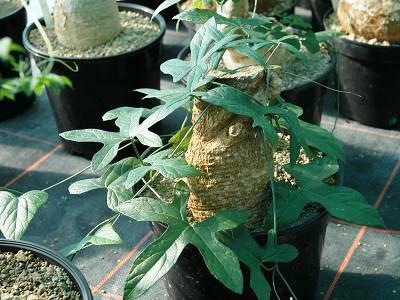 The caudex can grow to 20 centimetres in diameter, the vines can reach for ten metres or more. The flowers are yellow.